↑ Jean M. Moniz. "Biography". Frank-Grillo.com. 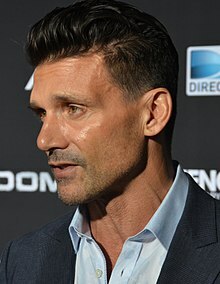 Frank Grillo's Official Website. मूल से August 29, 2008 को पुरालेखित. अभिगमन तिथि March 15, 2012. ↑ Jeri Jacquin (January 26, 2012). "FRANK GRILLO: The Grey". Military Press. अभिगमन तिथि December 31, 2014. ↑ Mike Ryan (June 16, 2014). "Frank Grillo: On the Verge With 'The Purge: Anarchy' and Returning For 'Captain America 3' Read More: Frank Grillo: On the Verge With 'The Purge: Anarchy' and Returning For 'Captain America 3'". Screen Crush. अभिगमन तिथि December 31, 2014. SC: You don't look 50. FG: I'm actually not really 50. SC: You aren't? FG: It's OK, I don't mind people saying that I'm 50. But, no, I was born in 1965 and IMDb has 1963. Whatever. I'm still old. I just had a birthday. ↑ Frank Grillo [@FrankGrillo] (June 8, 2014). "Thanks all for the B-Day wishes. Much love and appreciation!!!" (Tweet). मूल से May 1, 2016 को पुरालेखित – वाया Twitter. ↑ Graser, Marc (October 29, 2012). "Frank Grillo to play Crossbones in 'Captain America' sequel". Variety. मूल से November 1, 2012 को पुरालेखित. अभिगमन तिथि October 29, 2012. ↑ Samantha Highfill (November 24, 2014). "Frank Grillo talks Crossbones' return in 'Captain America: Civil War'". Entertainment Weekly. अभिगमन तिथि 31 December 2014. ↑ Kelley, Seth (6 August 2017). "China's 'Wolf Warriors 2' Dominates International Box Office With $163 Million". Variety.